WHEN THE PRESBYTERIAN CHURCH in America asked Tim Keller to start Redeemer Church in Manhattan, two others had already turned them down. The challenges of living and preaching in the oldest and most densely populated of the five boroughs of New York City seemed daunting, to say the least. But believing God was in it, Keller accepted. And watched the church multiply from 50 to over 5,000—the bulk being urban professionals. His books reached them too. The Reason for God, The Prodigal God, and Counterfeit Gods became perennial bestsellers, and like his preaching readily spoke of difficult Christian truths, stressing personal conversion, compassion for the lost, and the full authority of the Bible. But Keller’s ministry is notable not only for winning over skeptical New Yorkers, but for its missional approach, planting more than 175 churches around the world. In this interview with Servant he talks about Islam, Rob Bell, and his love for skeptics. Phil Callaway: Hi, Tim. Thanks for taking the time to talk with me during lunch. Tim Keller: No problem at all. You came to faith in college, is that right? What kept you from faith? I don’t think I was actually holding back from faith. I was raised and confirmed in a Lutheran church but I just hadn’t connected in my heart and it had no effect on how I lived. But when I was converted in college I looked back on the things I learned in my confirmation class and much of it was good, sound doctrine. The gospel just finally ‘came home’ to me in college. Many are referring to you as the next C.S. Lewis. How does that feel? First of all, I’m inspired by Lewis, but I’m a preacher first of all, not a writer, and I don’t even deserve to be mentioned in the same sentence as a writer like C.S. Lewis. I take it as a compliment, but it’s pretty unjustified. If I asked you what religion you are, how would you answer? I’d say I’m a Protestant Christian. If I asked if you were an evangelical, how would you respond? I’d say probably. It depends on what your definition is. If you say evangelicals are people who believe in the Rapture, I’d say no. I’d want to know what you meant by it, but I’m happy to own the term in general. How can conscientious believers credibly counter the damage done by, say, the judgment day folk back in May 21? Is that something you’ve come up against? No, not really. I guess to most New Yorkers it’s sort of a fringe cult, although I know that the beliefs of the Family Radio group are orthodox Christian beliefs. I would say that a cult is someone who doesn’t believe the apostles creed or the basic tenets of the Christian faith, like Jehovah’s witnesses or something like that. But for most people, “cult” just means extreme nutty. I actually do think that most people in New York understand the difference between that and most of the evangelical world. But viewing evangelicals as the “Christian right” is what has created a backlash in most younger people. Their perception is that evangelical Christians got involved in America in the political process and have tried to impose heavy moral values on people and they basically see it as coercive and totalitarian. A lot of that’s unfair but that’s the image. New Yorkers are used to guys standing around with signs anyway? Yes, I’m not sure how that Howard Camping thing hurts all Christians. It’s just another nut. 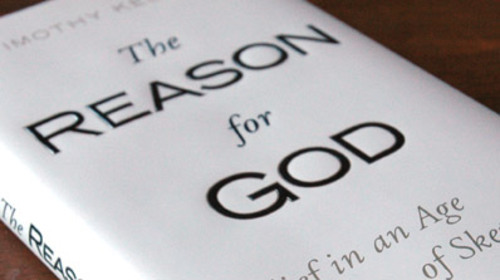 Your book The Reason for God was my introduction to your ministry. I was hooked, partly because I wanted to find answers for a militantly anti-theist friend whom I have been in touch with for about two years. It’s been very interesting to relay some of your comments. What is your advice to those who are dealing with someone like that in their lives? I know that’s a very broad question, but what would you say to a guy like me if you just had a minute? I’d say, don’t think in terms of what used to be called friendship evangelism. Just think in terms of friendship. That is, your evangelism should be organic and natural. It shouldn’t be a bunch of little bullet points and agenda items that you enter into a conversation hoping to get to so you’re almost like a marketer. Basically you should just be trying to befriend a person who’s not a Christian and then you just naturally talk to them about how you see reality. If an issue comes up, just be a friend and don’t hide your Christianity. Things will go in a natural way. I think people either try to push Christianity on others without being their friend or they are their friend but they hide their Christianity. So if you are a friend who doesn’t hide your Christianity I think things will go along well. What do skeptics need most from Christians? Well, what they really need is a Christian friend they admire. Let me give you an example: thirty or forty years ago most of us knew gay people, but we didn’t know we knew gay people because everybody was so carefully quiet about it. And as a result, you could believe stereotypes about them. Today, younger people especially almost all know somebody who’s gay because the culture has changed so that as much as possible, you come out. And because most young people know somebody who’s gay, they realize they’re normal people and in many cases, admirable people. And as a result, whatever else, they cannot believe stereotypes or blanket negative statements about them. Most skeptics I talk to probably do have Christian friends but they don’t know that they do. Christians are like the gay people were forty years go. They hide it. Basically, there are all sorts of smart, admirable Christians out there but most skeptics don’t know them and what they need more than anything else is not so much an argument but an admirable human being and to see that a big part of what makes them admirable is the Christian faith. Having Christian friends they admire will make the faith more credible. In a recent email I asked my friend which Christians he admired. He mentioned some historic believers and Martin Luther King and then he put me at the end of the sentence. I thought maybe he was making a joke, but anyway, it’s been a fun friendship. It’s been helpful to me to see the respect you show those whose beliefs are diametrically opposed to yours. Why is that important to you? Oh, it seems to fit in with a man who dies for his enemies saying, Father, forgive them. They don’t know what they’re doing instead of saying, Father, judge these idiots! Isn’t that generous? And here are his disciples, supposed to be his best friends, and they’re falling asleep when he’s in his hour of greatest need. He’s asked them not to but they do. Then he says, The spirit is willing but the flesh is weak, which is another way of finding something good to say. He says, I know you meant well. It’s astounding that at a time like that he could find something good to say instead of just slashing at them. The reason why you are respectful is because of the way Jesus was. In fact, even to Pharisees like Nicodemus he was pretty nice, too. He was more tender with some people than with others, of course, but in general his default was respectfulness. Does that reflect an understanding of grace in your own life? Some people think you’ve gone a bit too far. You said in one of your books that on the whole churchgoers may be weaker psychologically and morally than non-churchgoers. Come on, Tim. Is that really true? It’s possible, especially in a particular spot. In other words, there are people who know they need God because they have had troubles or failures in their lives and they know they need God. And then you have all the people whose lives are going along just fine. They’re disciplined, their parents love them, they’ve worked very hard. They actually do need God but they don’t know they do because their lives are going along pretty well. So very often the people who don’t feel they need God are maybe naturally stronger people. It’s not going to be enough to take them to the end of their lives and certainly not enough to save them, but I actually think that people who are more able and talented very often are the last to see their need for God. And therefore, person to person in a given town you might actually have weaker people in the church than the people outside. I remember reading that in The Reason for God. In the same book you address seven questions. Has there been any shift in the questions since you wrote the book or one that’s come to the forefront or a new one you would add? That’s a good question. I haven’t done any kind of sustained reflection on it, but my first reaction is that a derivation of, say, Christians perpetrating injustice. One of the things that is often brought up today that hasn’t been brought up since the beginning of the church is the idea of whether Christians can believe in absolute truth and still be good citizens. I think it’s already in there (the book) but it wouldn’t be bad in future editions maybe to call it out and give it its own chapter because there are more and more people who say, Look at Islam. People who really are true believers of Islam are intolerant and you can’t have democracy. The only way you can have democracy is if people get very liberal and relativistic about their beliefs. What they’re saying very often is that evangelical Christians are not good citizens because they’re going to impose their views on everybody else and what you need is a belief that truth is relative and everybody should be free to go about doing things their own way. I’m increasingly hearing that for the sake of democracy religion really has to take a back seat and really strong Christians are not good citizens. So that might one I’d add. Well, it’s actually in Chapter 1. People don’t realize, of course, that they do have faith and they do have moral values. Even to say it’s intolerant, to say your truth is wrong, my truth is right is a view of right and wrong right there. So the point is that everybody’s got a faith, everybody’s got a sense of moral values that they believe is better than somebody else’s view and it’s not based on science; it’s essentially a set of ‘religious’ beliefs. I don’t know that I mentioned it in the book but there are two kinds of secularism: programmatic and procedural. Programmatic secularism is saying that there is such a thing as a neutral view of life and religious people need to learn how to keep their religion private but in the public, secular world we can only argue from reason and science. That’s the older approach to secularism. It’s called programmatic—we’re going to put our secular program into place everywhere. Procedural secularism says that the government is neutral with regard to these various actors who are putting forth their particular view of right and wrong in the public sphere and may the best man win, may the one who gets the most votes win. But there’s no neutrality. Procedural secularism is basically saying that the government is a neutral umpire that makes sure everybody’s civil, that makes sure that nobody tries to make the marketplace of ideas no longer free, but that in the marketplace of ideas, everybody is selling something. And that something is always a set of moral views that are not completely empirical or rational, but they’re based on essentially religious assumptions and worldviews. So procedural secularism is very, very different from programmatic secularism. I would definitely pull that out and make it a chapter in the future because I think that once you lay the difference out, it gets very hard to argue for the older totalitarian, programmatic secularism and yet a lot of people still want to do it. I know in Canada they still do, that’s for sure. You mentioned Muslims. Have you had any general or apologetic interaction with Muslims about Christianity? And if so, what have you found about the gospel that you could appeal to in them? Well, not recently. Weirdly enough, I had a lot of heavy apologetic involvement with Muslims in Philadelphia before I moved up here. There are lots of Muslims in New York City but it just hasn’t been one of the fronts that Redeemer has been involved with. We actually have baptized Muslim converts here but in general it’s just because people who were Muslim have been brought to church and they’ve found faith and often they weren’t strong Muslims anyway. But in Philadelphia I learned that it worked better when you came in the front door and were willing to talk with the whole mosque about Christianity in open dialogue. They’re not at all happy if you go after individual members and pick them off or take them off to a Starbucks and twist their arm and alienate them from their families. So did they allow you a platform? Yes, I was part of a ministry that took one mosque and one church and paired them together and they had what were called “Meetings for better understanding.” You would meet in the mosque then in the church and invite members of both congregations to come and just have discussions. And I have to tell you, generally speaking, if you have speakers from Christianity and Islam both talking about what we believe about the mercy of God, about salvation, about life, Christianity looks pretty good. The place where they really press you is the Trinity because it’s a very hard thing to explain. You need some good comebacks. But in most every other area, Christianity seems so much more happy, frankly. I’ve been reading your new book, King’s Cross, and you talk about the Trinity. How much of that came out of your experiences with Muslims? Did you read the Time cover story “What if there’s no hell?” and their write-up on Rob Bell’s book Love Wins? I did, I read part of it on-line. How would you answer the question, Tim? What if there’s no hell? It would mean Jesus didn’t love me as much as I thought he did. That’s my answer. I thought God loved me but if there’s no hell, I guess he didn’t love me as much as I thought. On the other hand, if there is a hell, then God’s love for me is absolutely infinite and costly and sacrificial. If there is no hell then God’s love has cost him nothing. That’s the answer. Some claim you hold to the same view as Rob Bell but that he’s being criticized and you aren’t. I’ve heard that too. Would you please tell me how that could possibly be? Is it a fair critique? The only thing I can think of is like this: if my ten-year-old tells a lie and I say to the child, Because you have lied I can’t trust you and therefore I can’t trust you to do this thing I was going to let you do. I was going to let you go off and do this with your friends but that takes trust and I don’t have it and therefore I will not let you go. Now what is that? One the one hand I’m saying, you’re guilty and I’m punishing you. On the other hand it’s also a kind of natural consequence as well. It’s an active punishment on my part and yet at the same time there’s also a certain amount of natural consequence as well. Sometimes things go wrong. For example, if you eat fatty foods you have a heart attack. And that’s a punishment that’s only a natural consequence. Nobody has fined you or pronounced you guilty, right? So some punishments have only natural consequences and some punishments are actually artificial. You ate fatty foods so here’s your fine. Do you see the difference between the two? But when I’m punishing my children, I’m punishing them actively and yet at the same time giving them a natural consequence. So hell is an active punishment from God by his wrath, but it’s also a natural consequence of losing God’s presence. It’s like God says, If you do not want me in your life, then I’ll leave. So it’s both a combination of both a natural consequence and it’s an act of wrath. C.S. Lewis loves to talk about hell as the natural consequence. He’ll say “a person who grumbled and grumbled and grumbled in the end becomes nothing but a grumble.” I love to play that up. Rob Bell, that’s all he’s got. In his book he says that there are natural consequences to sin but in the end God’s not really angry at you and therefore hell is more like a purgatory. So what he would say is there are natural consequences but there’s no active wrath on God’s part. C.S. Lewis did not believe that. He believed there were natural consequences AND that it was an appointment from God in his wrath. But Rob Bell says it’s only a natural consequence and eventually you sort of purge yourself out and God’s not really angry at you. So if there is a hell it’s not really permanent. I have never said that or anything like it. So when Rob Bell thinks that if there is a hell it’s not permanent and God’s not mad at you and I believe that there is a hell and it is permanent and God is angry at you, I don’t see how it’s the same at all. It’s just because in my book The Reason for God I like to bring out, for non-Christians, if you show them that hell is a natural consequence, it makes sense to them and scares them. But of course, that’s not the whole picture. It’s also that God’s actually appointing you to that in his wrath. What if I say I can’t believe in a God who punishes and judges me, God is a God of love? The source of the idea that God is love is the Bible. The Bible tells us that the same God is a God of judgment who will set things right in the end. In two weeks my daughter marries a youth pastor. Any advice you’d offer a young minister of the gospel, anything you wish you had learned a little sooner when you were starting out in ministry? This is not the only thing by any means, but maybe two things. One is that prayer is more important than you think. And the other thing is that once you’re in leadership, there’s always somebody mad at you. Get used to it. [Laughs.] A book you’re enjoying right now that may surprise me? I read a new book by Michael Allen called Reformed Theology, which I really liked. And a book by David Mamet called Theatre. It’s basically his take on plays and theatre. It’s really, really good. A movie you’re glad you watched in the past year or so? I don’t know…maybe BBC. They put out an updated version of Sherlock Holmes in three 90-minute episodes. They’re terrific. The new BBC Sherlock Holmes remake. You and Kathy have been married 36 years. A few reasons you’re still married? Repentance and forgiveness. It’s simple. As long as you can do that, you can stay married. As an evangelist and a man of prayer, if I can. appreciate you very much, Tim. You are a blessing—keep it up. You’re very kind, Phil, that’s all I can say. Request a complimentary subscription to Servant Magazine. Just email us.